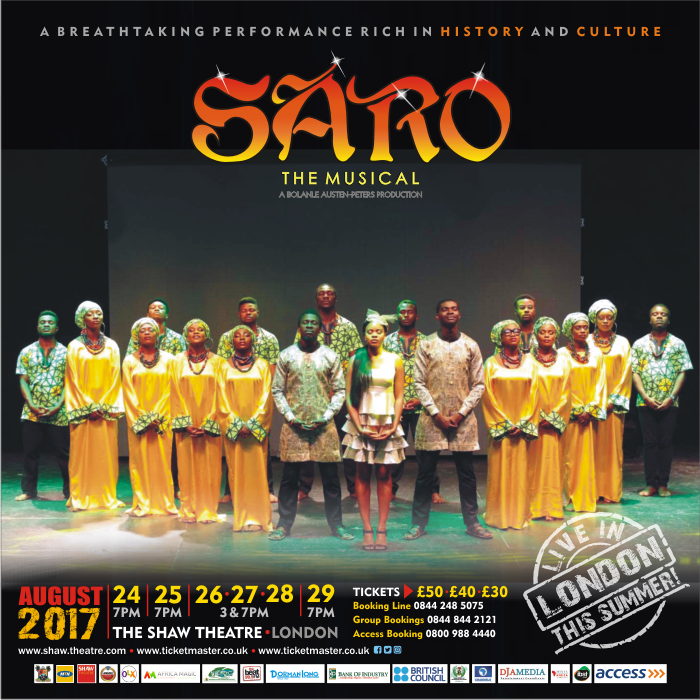 As the Nigerian theatre industry continues to grow and attract interest locally and internationally, contemporary Nigerian Theatre will be on display in London in August when SARO the Musical will open to the public at the Shaw Theatre London. 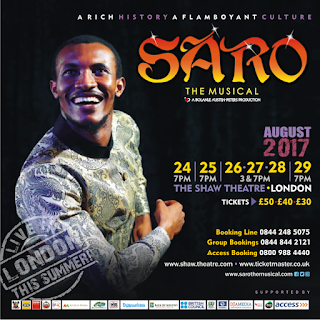 ‘SAROThe Musical’ is mixed with colours of hope, self-will, love and determination which results into a moving artistic portrait of ‘The African Dream.” In SARO we explore the journey of four young courageous Village men who step out of their comfort zone to the city life of Lagos the land of opportunities in search of success. 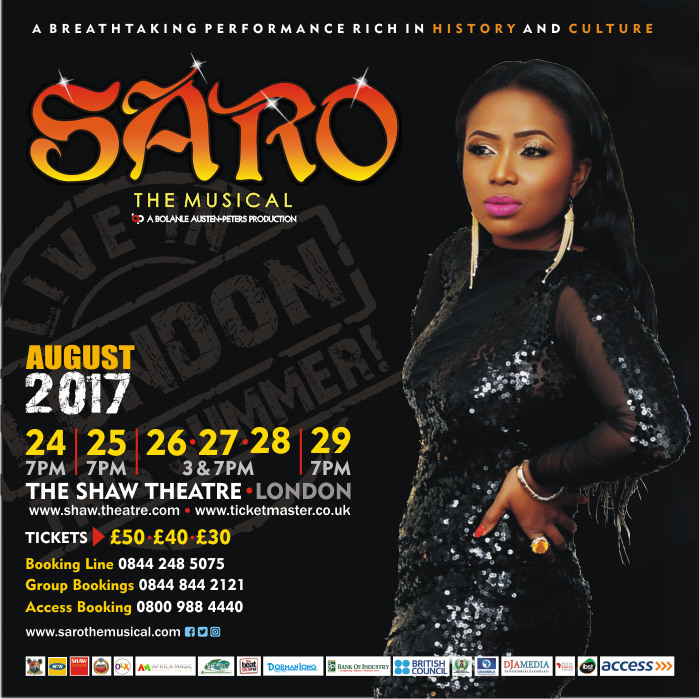 Saro paints an honest picture of life in the city, the ups and downs, the smiles and the tears. SARO takes you on a rollercoaster of emotions through stellar acting, rich costumes, vibrant dancing and music. Saro as a play speaks the universal language of music. 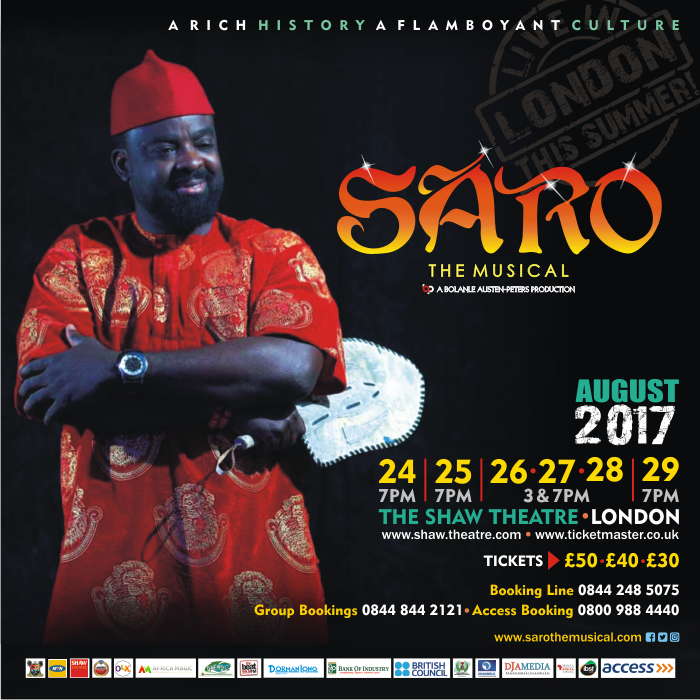 The type of music that not only satisfies beyond the African audience but also satisfies those who crave music that feeds the soul. 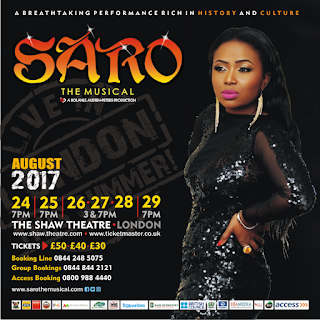 Saro is a realistic exposure to characters that are relatable with a warmth to them that make you feel you are welcomed into their world no matter who you are or where you are from. The directing style opens up your imagination to the characters and their world making it a recipe that a family craves with the ingredients of joy mixed with heavy laughter, sprinkled with empathy and a dose of heartfelt love. This results in a delicious final product of worthy entertainment. 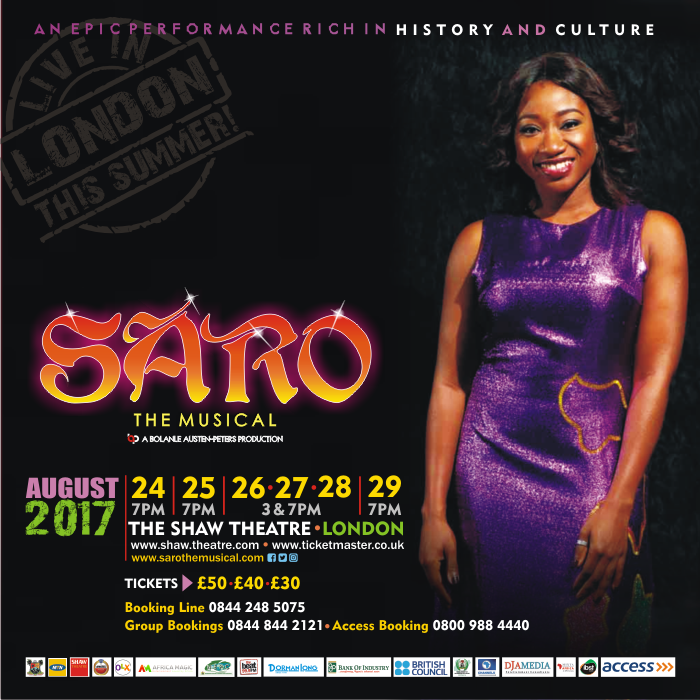 Bolanle Austen-Peters, the force behind Terra Kulture, one of Nigeria’s most successful and influential arts, cultural and production companies, says "Due to popular demand, we are taking the show to the largely discerning and open London population. Waka! 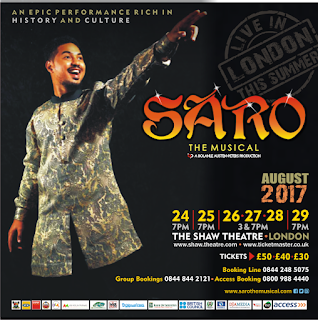 The Musical is a proudly Nigerian cultural export that has the potential to boost cultural diplomacy and promote our cultural heritage abroad. It will provide the highly talented and creative youths involved in the production also with opportunities to experience the UK creative space and technology driving the UK creative industry. Aug 24th - 7 pm. Aug 25th - 7 pm. Aug 26th - 3 pm, 7 pm. Aug 27th - 3 pm, 7 pm. Aug 28th - 3 pm, 7 pm. 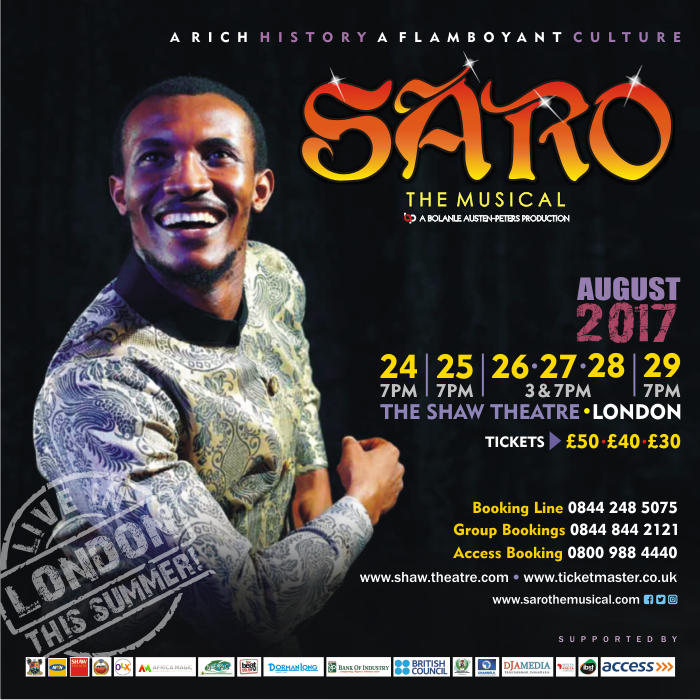 The Shaw Theatre, 100-110 Euston Road London’s West End. 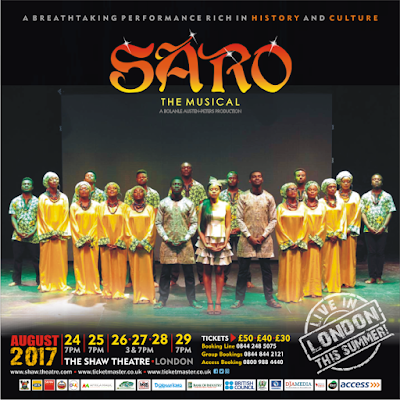 SARO THE Musical London has been made possible by the support MTN, BANK OF INDUSTRY, DORMANLONG, LAGOS STATE GOVERNMENT, NIGERIAN EXPORT PROMOTION COUNCIL, the Nigerian Ministry of Culture and Information, Africa Magic, Beats FM, Ebonylife, IBST, MIXTA, Access Bank, Standard Chartered Bank amongst other partners.